With a dramatic upsweep of her glorious wings, this black Goddess made wind. Here, she shows off in all her splendid glory, standing with wings spread. Isis: Greek/Roman. Inventor of agriculture, law and medicine. Isis was worshiped throughout the Greco-Roman world as the Goddess who placed the Sun God Ra in the sky and according to Egyptian scriptures, "In the beginning there was Isis, Oldest of the Old." She married her husband-brother Osiris and conceived Horus, the original Son of God. Her "Mother of God" or "Divine Mother" role was later assumed by the Virgin Mary. Wings spread on bended knee, hieroglyphic hymns praised the Great Goddess Isis as "she who made light with her feathers and wind with her wings." 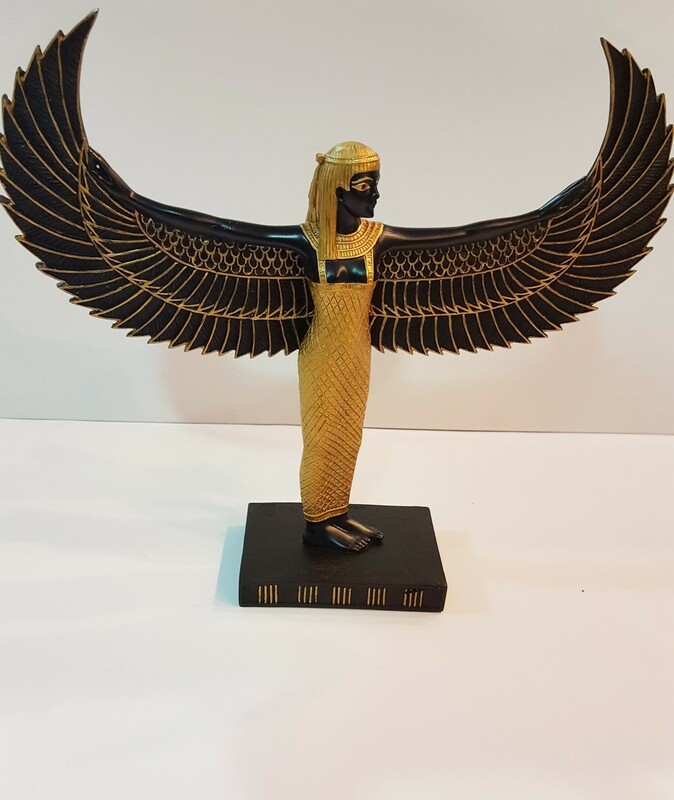 The magnificent golden colored statues are reproduced from a royal mummy case, on which her form was painted in order to catch the departing soul in her wings and shepherd it to a new life. Her wings are symbols of her role as a protectress. Standing Isis at top of page: here, she carries the ankh and the papyrus scepter of Goddesses; the horns and sun disk of Hathor. She wears a feather dress and a headdress composed of a vulture, showing that she was identified with the Goddess Maat. When Alexander the Great conquered Egypt in the 4th century B.C.E., Egyptian art took a decidedly Hellenistic turn. This beautiful reproduction of the black basalt statues recently recovered from the Mediterranean Sea off the coast of Alexandria is the classical Lady whose "divinity is adored throughout all the world in divers manners, in variable customs, and by many names." As Apuleius describes Her speech, "I am she that is the natural mother of all things, mistress and governess of all the elements, the initial progeny of worlds, chief of the powers divine, queen of all that are in hell, the principal of them that dwell in heaven, manifested alone and under one form of all the gods and goddesses."